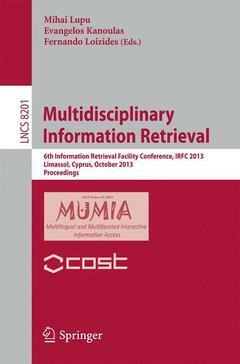 This book constitutes the proceedings of the 6th International Information Retrieval Facility Conference, IRFC 2013, held in Limassol, Cyprus, October 2013. The 8 papers presented together with 2 short papers were carefully reviewed and selected from 16 high-quality submissions. IRF conferences wish to bring young researchers into contact with industry at an early stage. This sixth conference aimed to tackle four complementary research areas: information retrieval, machine translations for search solutions, and interactive information access. Multilingual and Cross-Lingual News Analysis in the Europe Media Monitor (EMM) (Extended Abstract).- Ontology Based Query Expansion with a Probabilistic Retrieval Model.- A Machine Learning Approach for Subjectivity Classification Based on Positional and Discourse Features.- Recall-Oriented Evaluation for Information Retrieval Systems.- Using ‘Search Transitions’ to Study Searchers’ Investment of Effort: Experiences with Client and Server Side Logging.- An IR-Inspired Approach to Recovering Named Entity Tags in Broadcast News.- An Exploratory Study on Content-Based Filtering of Call for Papers.- Domain Adaptation of General Natural Language Processing Tools for a Patent Claim Visualization System.- Concept Extraction from Patent Images Based on Recursive Hybrid Classification.- Towards a Framework for Human (Manual) Information Retrieval.- A Generalized Framework for Integrated Professional Search Systems.